Dr. Davidson uses state-of-the-art 3D treatment planning technology to provide stable, fixed-in teeth in one day. Using the revolutionary New Teeth in One Day procedure, Dr. Davidson can perform any necessary extractions and provide you with a full set of firmly fixed-in implant-supported teeth, all in a single day. Your new teeth will have nearly the same chewing power as that of natural teeth. 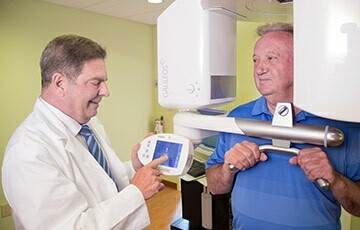 Due to the special techniques used in this procedure, bone grafting is unnecessary in most cases, even for patients who have experienced severe bone loss. Implants need a certain volume of dense bone available in the jaw to be stably placed. In the past, this was often a problem for patients seeking full-arch tooth replacement with dental implants. Lengthy bone grafting procedures were often necessary to build up enough support for dental implant treatment to even be possible. 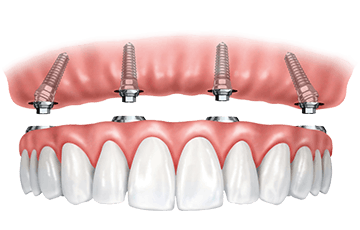 With the New Teeth in One Day procedure, four or more specially designed implants are placed in strategic positions that take advantage of specific areas of dense bone that exists in almost every patient. This eliminates the need for bone grafting for most patients, and has made getting fixed-in new teeth faster and more affordable. 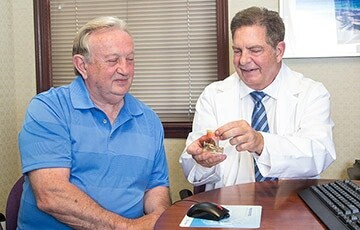 After preliminary diagnostics and preparation, Dr. Davidson performs the entire procedure in a single day. He takes care of any needed extractions, places all your implants and provides you with a temporary and functional set of replacement teeth to wear while your implants heal. Your final new teeth will be fixed-in once healing is completed. Your final new teeth will be meticulously crafted to Dr. Davidson’s exact specifications. Dr. Davidson has your temporary and final new teeth crafted to exact specifications so they are durable, comfortable and aesthetic. 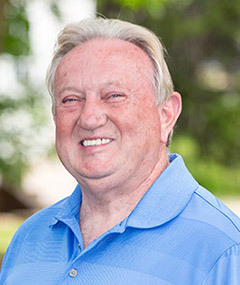 To ensure a result that meets the highest standards, he uses a top-tier dental lab that does state-of-the-art restorative work for dentists all over the United States. Your final teeth can be fabricated from a variety of top-quality materials. Dr. Davidson will discuss the various options with you and will make recommendations based on your situation and budget. Since the chewing power of your new teeth will be close to that of real teeth, you will be able to easily eat the foods you need for proper nutrition. You will not have to resort to a blender or cut your food in tiny pieces. Because your new teeth are securely fixed onto implants, they won’t move around in your mouth. Thus you will not end up with the painful sores that can result from loose dentures. Your upper teeth will have no false palate. A false palate inhibits your sense of taste, blocks your perception of heat and cold and can cause slurred speech. With fixed-in new teeth you will be able to speak clearly. Eating and drinking will be safer and more enjoyable. To maintain its volume and density, the jawbone requires stimulation from regular biting and chewing pressure on tooth roots. When teeth are missing, this pressure is absent and bone loss occurs as a natural biological process. Unfortunately, traditional dentures do nothing to prevent bone loss, and in fact only accelerate the rate of loss. Continued bone loss will eventually cause any denture to fit poorly, and will give the lower third of your face to get a “collapsed,” prematurely aged look. Because dental implants replace the natural tooth roots, they provide the stimulation needed for the jawbone to maintain its volume. Implant-supported dentures therefore help prevent further bone loss and can help retain a more youthful appearance. Dr. Davidson will meticulously execute each step of your treatment to ensure a stable, beautiful and long-lasting result. 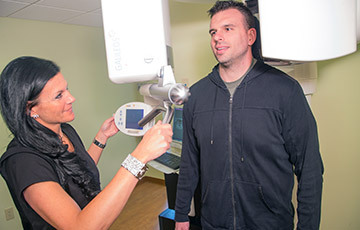 Dr. Davidson uses high-tech 3D diagnostics for precise and accurate treatment planning. 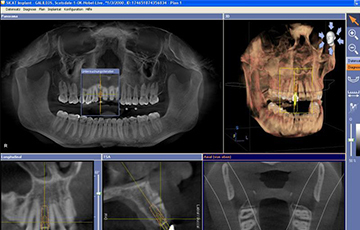 Your treatment begins with a comprehensive oral exam which includes full digital X-rays. 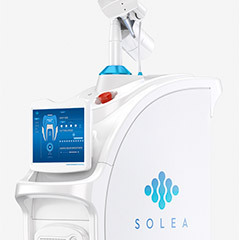 We will also use our state-of-the-art cone beam 3D dental scanner to obtain 360-degree images of your teeth, jaws and surrounding structures. Dr. Davidson will use these images to determine the best positions for placing your implants. 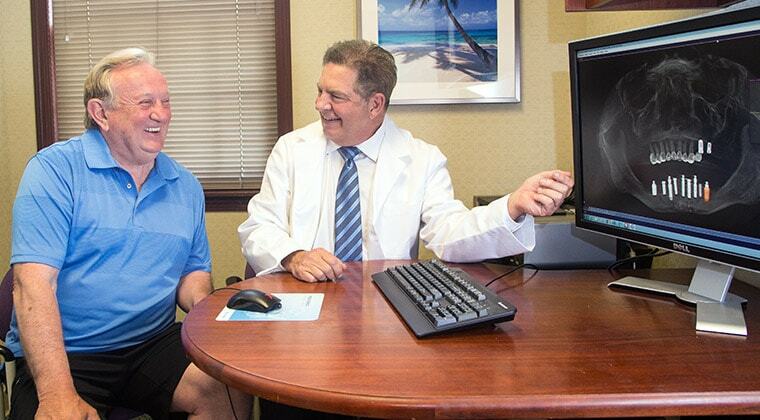 3D software allows Dr. Davidson to simulate the actual implant surgery, resulting in a highly predictable outcome. Dr. Davidson will load your scan into special 3D treatment planning software, which he will use to map out the exact position, depth and angle of insertion of each implant. The software allows Dr. Davidson to simulate the actual surgery, resulting in a highly predictable outcome of the actual surgical procedure. Using the same 3D planning software, Dr. Davidson will create a surgical guide with markings for the exact positions and angles of your implants. Use of a surgical guide makes implant placement highly accurate, efficient and more comfortable. On the day of your procedure, Dr. Davidson will extract any remaining teeth, place all your implants and provide you with a well-fitting and functional set of temporary teeth to wear while your implants heal. He will also give you instruction on how to care for your new teeth and what kinds of food you can eat during the healing period. 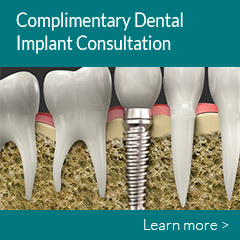 Once your implants have healed, Dr. Davidson will permanently attach your final new teeth. Your new teeth will look very lifelike and aesthetic, will fit very comfortably and will have nearly the same strength and chewing power as natural teeth. Eating the foods you want and enjoy will be easy, and you will be able to speak and smile with confidence!